This Nvidia branded desktop from Cyberpower should offer the best Nvidia graphics, right? 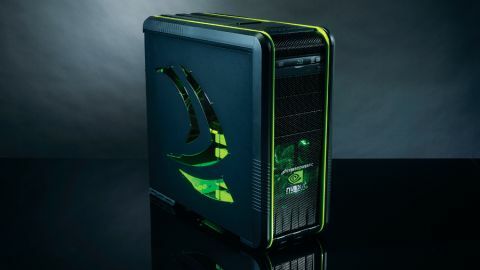 Fans of the big green graphics company rejoice, Cyberpower is showing its love of all things Nvidia here with a rig that's ripe for the fanboys. The SI has put some decent parts together for your pleasure, all of which are bathed in the eerie, mushypea glow of the Cooler Master 690's LEDs. We say 'decent', because we're not entirely enamoured with Cyberpower's choice of components. It's the choice of graphics card that really has us stumped. We know that it's a new graphics card, but the GTX 660 Ti really isn't the sort of component we'd want in a rig we'd just paid a grand for. That's especially true when we're seeing overclocked GTX 670s, GTX 680s and an overclocked HD 7970 in the other machines. Scan was the only other system integrator to opt for Nvidia's mid-range make-weight, and together they prop up our list of gaming benchmarks. Up against the superior GPUs of the other rigs in the test, the GTX 660 Ti looks very, very weak. Still, it means Cyberpower has been able to stick a Blu-ray drive in the rig, and we all know how useful they are for gamers. To be fair though, the cost of a Blu-ray ODD is probably not that much more than a DVD drive these days, so we can't be too harsh on it. The cash freed up by going for a weaker GPU has arguably gone into the choice of solid state drive. At 128GB, the Crucial M4 boot drive certainly isn't vast, and will only let you install a few of your most frequently played games, but it's nevertheless one of the strongest SSDs in the test. It offers fantastic 4K random read/writes in the AS SSD benchmark, and delivers excellent boot times. Along with the AdvanceTec rig, it's also one of only two in this test to use water-cooling on its overclocked processor, and like the AdvanceTec, it actually has a relatively conservative overclock applied to it. At 4.5GHz its i5-3570K is certainly no slouch, but 4.6GHz is what we've come to expect from even the lowliest Z77 motherboard. This build is hanging out around the bottom of the CPU performance charts, and with a high quality liquid chip chiller installed in that glowy chassis, we were expecing more. We can't help but feel a little disappointed by this latest Cyberpower system. With its bold and brash Nvidia branding, we'd have expected graphics to have been one of the components it prioritised above the others. Sadly, by going for the GTX 660 Ti, Cyberpower has left the machine languishing in the benchmark doldrums. With the slightly conservative overclock on the i5 CPU, combined with the weaker GPU, the Infinity Apollo comes up short almost across the board. Only the decent showing by its choice of SSD gives it any semblance of pride against the competition. This is by no means a poor gaming PC, but if you're thinking of spending this much money, the majority of the other machines in the test would get our vote.